Smaller PWC Better Fit for Private Yacht Charter Vessels Under 100 feet? The sales market for waverunners and jetskis – also known as personal water craft (PWC) – has been on the decline for several years, in part due to the fact PWC have become so gigantic, powerful, expensive and fuel hungry. While the price issue is of lesser concern to the owners of charter yachts, the size and fuel consumption issues do factor into the decision of whether or not a megayacht will carry one or more of these toys onboard for the use of the charter guests. Now, a smaller, lighter, and far more fuel efficient model has been introduced, and it might have an impact on smaller megayachts, particularly in the 80 to 100 foot range. The Sea-Doo “Spark” is approximately half the price, half the weight and half the power of a regular midrange PWC, and burns nearly ten times less fuel than other waverunners. Storage space is a major concern on yachts in the 80 to 100 foot range. The aft garage on a mid-size megayacht is rather tight – yet carrying an assortment of watertoys is important as many charterers clamor for water-based activities during their time onboard. 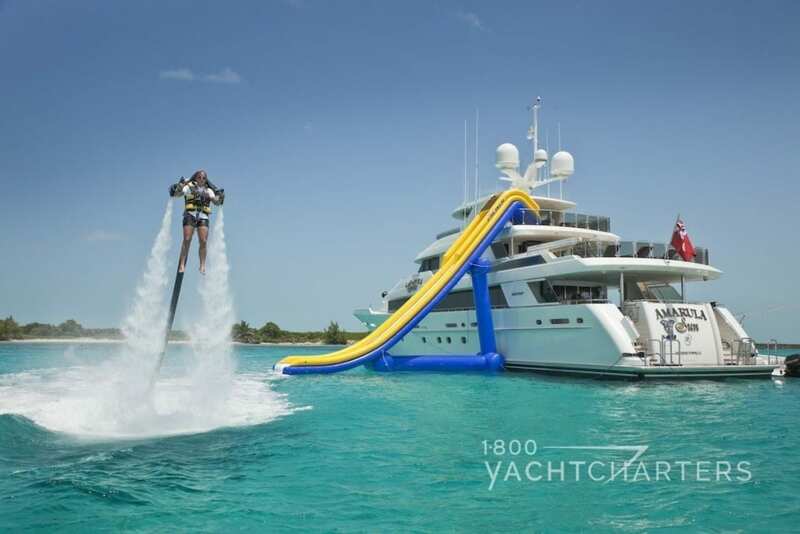 Indeed, it’s hard to imagine a Florida yacht charter vacation, in the warm, pristine Florida Keys, without spending time in the ocean, snorkeling, wakeboarding, and riding along on a waverunner. The Spark is smaller and lighter than other PWC, and it is easier to get in and out of a cramped yacht’s toy garage. Many vessels forgo carrying a large PWC, not just because of the size but also because the typical PWC guzzles LOTS of fuel, requiring the storage of large amounts of gasoline to operate the waverunners. This is both problematic and, for yacht owners and crews concerned about sustainability, an ecological issue. The Spark is the most fuel efficient PWC on the market, burning just 7.3 liters (1.9 gallons) of fuel per hour on the 60-horsepower model, or 9 liters (2.4 gallons) per hour on the “High Output” model. 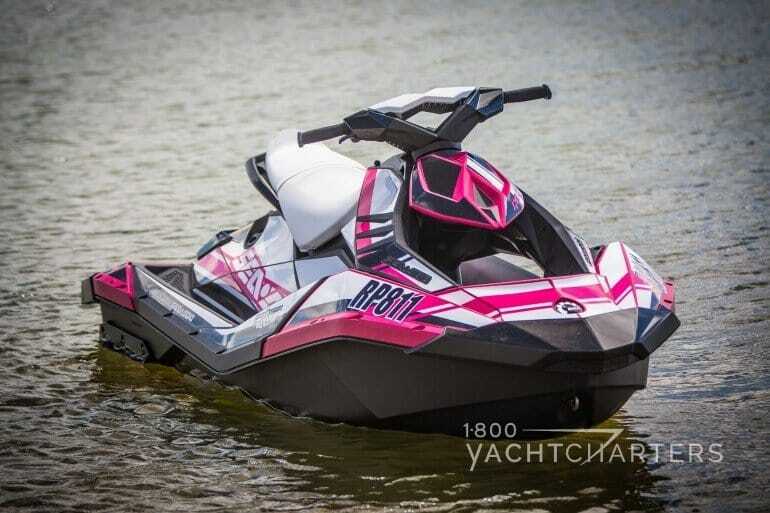 Compare this to a 250-horsepower Sea-Doo RXT-X model, which swallows 76 liters (20 gallons) per hour, and the Yamaha FX Cruiser requiring 80 liters (21 gallons) per hour. Carrying a Spark on a charter yacht would require less gasoline to be stored, and leave a far smaller carbon footprint on the environment. “The use of any personal watercraft (waverunners) is at the operator’s sole risk and is only permitted subject to the operator having the applicable license, if required, and meeting local regulations. For most charterers, the speed of the Spark should not be an issue, as the Spark can easily hit 80 kilometers per hour (around 50 mph)! WHAT do you think? 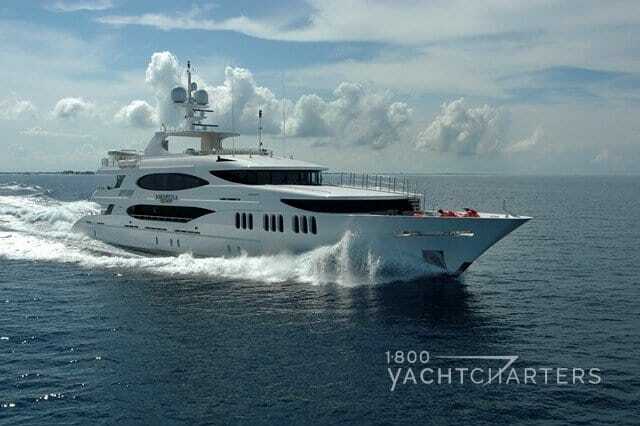 Will the Spark catch on with megayacht owners and crews? Share your comments with us, and we’ll send you a complimentary eco-friendly tote bag, courtesy of 1-800 Yacht Charters.